Volunteers have worked more than 100,000 hours restoring the Piedras Blancas lighthouse and surrounding buildings. 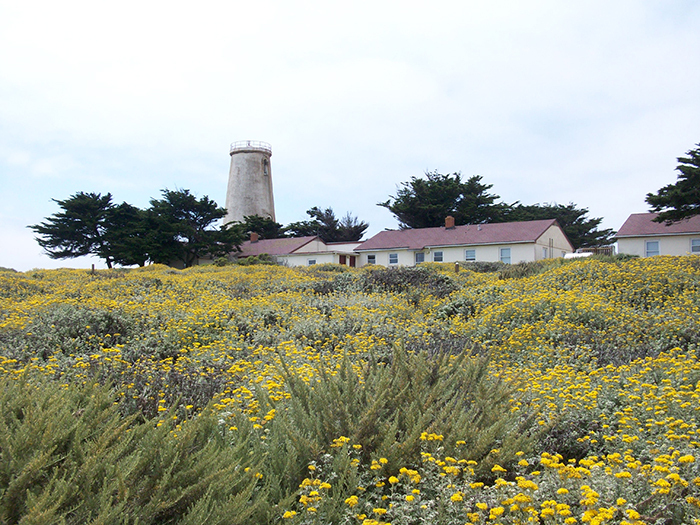 The Piedras Blancas Light Station, first illuminated in February 1875, is currently managed as a historic park and landmark and wildlife sanctuary by the United States Bureau of Land Management (BLM) and the Piedras Blancas Light Station Association (PBLSA). Take a peek at the winding staircase leading up to the lens housing area at the Piedras Blancas Light Station. 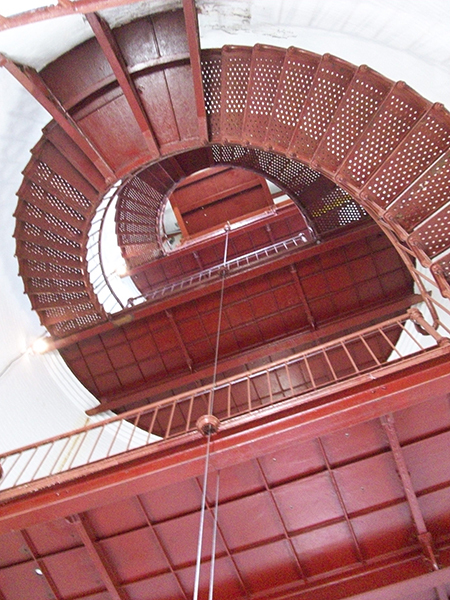 The lighthouse is 70-feet tall but once was 100-feet tall. The missing three levels held a fourth floor landing, the watch room and the lantern. Restoration of the original floors is underway. Volunteers have worked more than 100,000 hours restoring the lighthouse and surrounding buildings. The fuel oil house has been restored and a replica of the station’s shingled watch room has been completed in addition to other historic structures. The Piedras Blancas Light Station Association gift shop is housed in what once was a strip of small offices. The light station is named for the white rocks just offshore. The park occupies 19 acres of ocean side land six miles north of Hearst Castle on Highway One. Visitors can experience a variety of sea birds, sea lions and elephant seals along with other wildlife that lives in the area. Over 70 native California plant species have been identified with interpretive signs. For many years the area was overgrown with Capobrotus, the invasive, ice plant still growing in other locations in California. Volunteers worked long and hard pulling out this invasive plant and, miraculously, the native vegetation began to return on its own. Take in stunning views of the Central Coast while walking through the pathways of the Piedras Blancas Light Station. Access to Piedras Blancas is by guided tour only. Tours are offered Tuesday, Thursday and Saturday morning from Sept. 1 – June 15; from June 16 – Aug. 31 tours are offered Monday, Tuesday, and Thurs—Saturday. There are no tours on holidays. Fee is $10 for adults, $5 for children 6-17 and free for children 5 and under. No reservations needed for groups under 10. For 10 or more call (805) 927-7361 or email piedrasblancastours@gmail.com. No pets. Tours may be canceled due to inclement weather. Tours last about two hours and include a half- mile of easy walking. Visitors check in with staff at 9:45 a.m. at the former Piedras Blancas Motel located 1.5 miles north of the light station on Highway 1. Do not wait at the gate to the light station! Wheelchairs and strollers are available upon request. 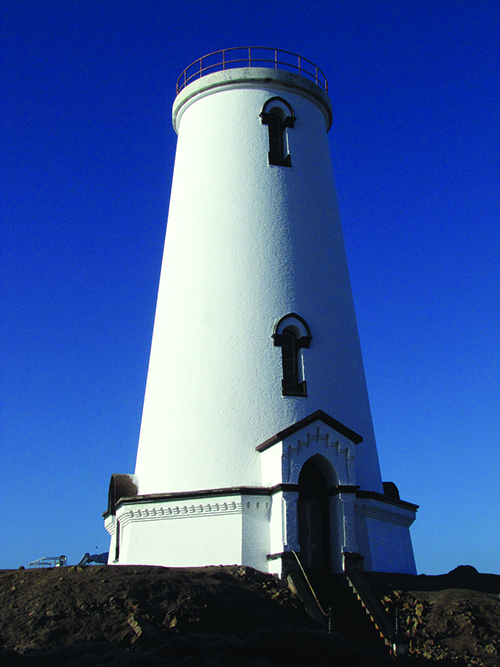 For more information visit the Piedras Blancas Light Station website, http://piedrasblancas.org.